“Pulpo” – more than a summersong! Pulpo: a new song, a new cocktail & a new bistro! Facio’s fresh and sunny acoustic song is available on iTunes, Amazon etc. from September 2016. Facio originally wrote “Pulpo” as a children’s song for his little niece and nephew. 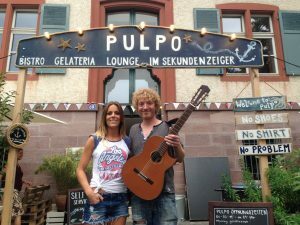 Years later he recorded the song on a hot summer day 2016 in Basel (Switzerland) very much inspired by a new beautiful and cosy Basel Bistro on the banks of the river Rhine, which is also called “Pulpo“. Facio presented his song there on the Swiss National Holiday. Picture: Eva Matt (who runs the Pulpo Bistro in Basel) & Facio. Posted in Releases, Uncategorized, Video.